The aim is to promote and support more scientific collaboration between both nations. Barañao and Ceccatto during its mission in the UK. Photo: courtesy Argentine Embassy Uk. During an official mission to the United Kingdom, the president of the National Scientific and Technical Research Council (CONICET), Alejandro Ceccatto, and the representative of the Royal Society of the UK in Great Britain and Northern Ireland, Sir Martyn Poliakoff, signed a memorandum of understanding to support the development of research bonds between both countries. The minister of Science, Technology and Productive Innovation, Lino Barañao, was also present during the signature. 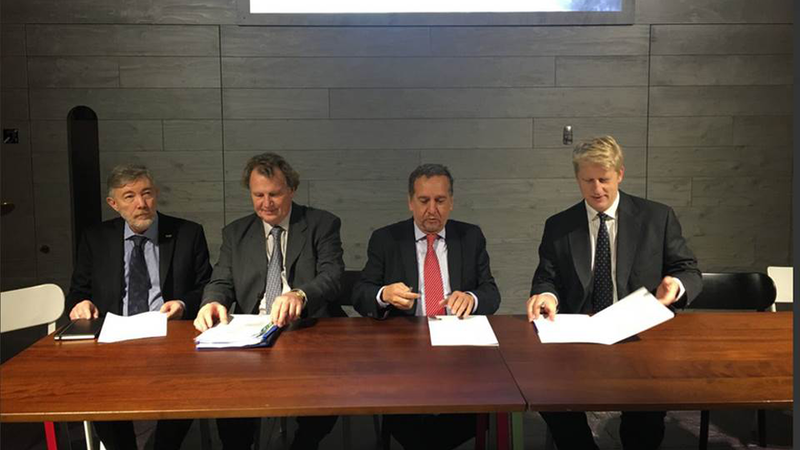 This memorandum – which is the result of the current bilateral relationship between both nations in terms of science, research and innovation– is going to make possible the funding of the exchange between researchers from Argentina and the UK. CONICET is going to offer the “Bilateral Research Projects Programme” to Argentine scientists who aim to collaborate with researchers from the UK who study natural sciences. For its part, the Royal Society is going to offer international exchanges for the scientists of the UK to work with Argentine scientists that also study natural sciences. Both organizations agreed to finance respectively a total of six new annual exchanges. Barañao and Ceccatto also visited the facilities of the European Bioinformatic Institute – an organization linked to the European Molecular Biology Laboratory (EMBL)- where the agreement with the Science Ministry and that institution was renewed. There were also meetings with the minister of Universities and Science, Jo Johnson, to talk about the possible mechanisms to increase the cooperation in the training of human resources and the joint work on specific topics of the bilateral agenda. Finally, at the Crick Institute, Barañao and Ceccatto met Paul Nurse, Nobel Prize in Medicine, to develop the guidelines for a public-private association of international cooperation destined to the postdoctoral training of Argentine scientists. There were also visits to the Harwell Science and Innovation Campus in Oxfordshire and the GSK laboratories in Stevenage.